Romance is alive in Shakespeare's England! Romance is alive in Shakespeare's England, one of the most stunning and romantic settings for Valentine's Day! Create handmade chocolate truffles, listen to a classical concert, stay in a shepherds hut at Hill Top Farm or a tower suite at Warwick Castle, dine at Warwickshire's Michelin stared restaurant or enjoy a mediaeval banquet fit for a King or Queen! Take part in a chocolate workshop at Henley Chocolates on Saturday 17 February from 7:30pm - 9:30pm. Explore the world of chocolate, working with different chocolates from across the globe. Learn about the origins of the flavours and pair them in classic and modern combinations to create a selection of handmade chocolate truffles to take home. The workshop takes place in Wootton Wawen and costs £30 per person. Listen to a concert by Orchestra of the Swan on 13 February at Stratford Artshouse in Stratford-upon-Avon entitled Roderick Williams and English Song. Baritone Roderick's performances of English music are greatly admired. The conductor is one of Poland's most outstanding young conductors. Tickets cost from £9.50 to £29.50. The concert is repeated on 14 February at Birmingham Town Hall. Take children along to look at love, relationships and marriage through the Museum's collections at Market Hall Museum in Warwick on Tuesday 13 February from 1pm to 1.30pm. Free drop in activity and no need to book. Pop the question at the UKs largest butterfly paradise - Stratford Butterfly Farm. Walk with your loved one through a tropical paradise with hundreds of butterflies flying around. As the days get longer, butterflies mate once again and practice a courtship routine to discover the suitability of their potential mate, similar to humans! The Cross at Kenilworth will be offering couples a 4-course dinner priced at £80 per person - including a romantic gift per couple. Dishes will be carefully selected and prepared by Adam Bennett and his talented team of chefs and will include seasonal delights you would expect from the only Michelin starred restaurant in Warwickshire. Take your loved one to lunch or dinner at the Royal Shakespeare Company's Rooftop Restaurant, which offers unique views across the river Avon in Stratford-upon-Avon. 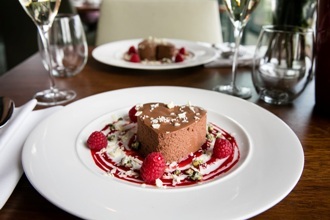 The RSC will be offering a romantic menu for two people from 14 - 17 February. Abbey ready to do battle tomorrow. Join the Knights for a last night of merriment and revelry before marching to war. Cost is £49 per person. Or enjoy a Mediaeval Banquet on Saturday 17 February, a feast fit for a King and Queen! The banquet includes a 4-course meal, an arrival drink of mead, wine and ale with the meal, a full stage show and a post-banquet disco. Cost is £44.95 per person. Both are suitable for ages 16+. Enjoy a sharing dinner at The Bell at Alderminster with a starter, main and pudding with the main course option being a Tomahawk Steak, back by popular demand plus choose from a special Valentine's cocktail menu. For those who dream of spending the night like a King and Queen then stay in a Tower Suite at Warwick Castle, the ideal location for a romantic getaway. Each Suite is located on its own private floor of the 14th century Caesar's Tower and comprises of an opulent bed chamber with four-poster bed in addition to contemporary en-suite facilities. Prices start from £550 per room per night including champagne on arrival, breakfast, a private tour by one of the Castle's History Team specialists, personal concierge and complimentary luggage porter, car parking, and 2 days priority access to the Castle attractions including the Castle Dungeon. Family stays are also available (Rose Suite only) from £600 per night. Stay overnight in a wooden cabin, luxury bell tent or a beautiful shepherds hut at Hill Top Farm near Royal Leamington Spa. All have double beds and camp beds for children or a double sofa bed in the shepherds hut. The handmade horse trailer shower blocks offer high pressure showers with heated towel rails and were made on site, so offer something completely unique to the experience. Hilltop Farm Shop and Café serves and sells local food and drink throughout the day and is open in the evenings on Friday and Saturday nights. Book into The Stratford or Stratford Manor Hotel and experience their romance package which includes dinner, bed and breakfast plus chocolates and a bottle of sparkling wine in the room on arrival. The Stratford costs from £314.20 and Stratford Manor from £308.25. The offer is based on 2 people staying for 2 nights and is subject to availability. chocolates, starting from £220 per room.